In addition, it features shorter analysis times and is more durable than nano flowrate compatible LCMS systems, which perform measurements within a flowrate range of several 100 μL/min to 1 μL/min. Furthermore, the Nexera Mikros improves operability, and at the same time, enables high-sensitivity analysis with smaller system capacity. This is due to the UF-Link, which enables one-touch connection and disconnection between the LCMS ionization interface and the analytical columns. 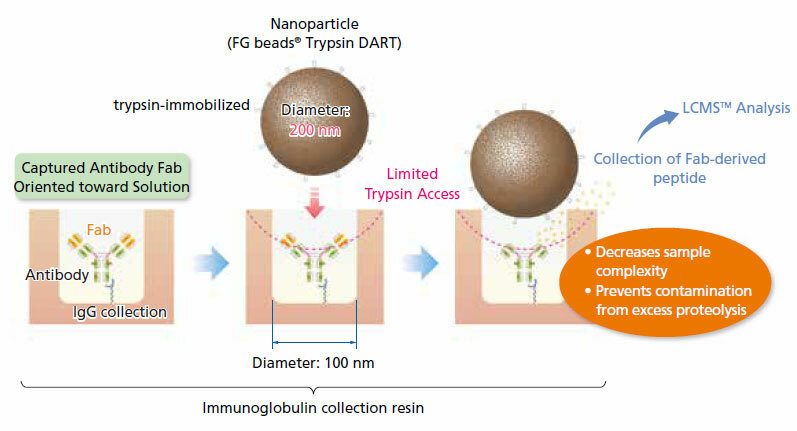 nSMOL (nano-surface and molecular orientation limited proteolysis) is a proprietary, ground-breaking process that enables selective proteolysis of the Fab region of antibodies using trypsin-immobilized nanoparticles. Fab-derived peptides are quantified via MRM measurement on a high-sensitivity mass spectrometer. The Nexera Mikros system achieved signal intensities 12 times higher than with conventional flow rates, with a corresponding lower limit of detection of 0.025 μg/mL and good linearity. 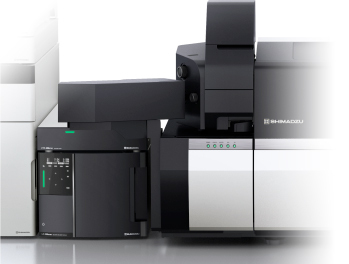 The Nexera Mikros system is ideal for low-level quantitation of peptides by LCMS. The following is an example of antibody drug analysis in plasma. The plasma spiked with trastuzumab was pretreated using nSMOL Antibody BA Kit. 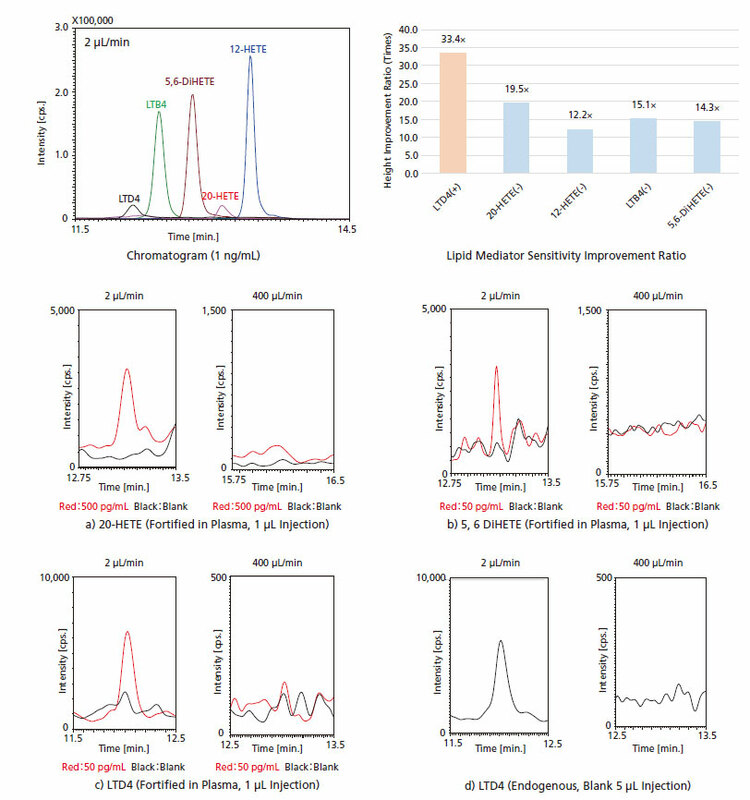 In the analysis of signature peptides deriving from trastuzumab, Nexera Mikros provides a dynamic range of 0.00763 - 62.5 μg/mL, good linearity with R2 > 0.99, and excellent accuracy of 101.0% (average). The intra-day reproducibility of this trastuzumab-derived-peptide analysis is summarized in the table below. These results show an excellent reproducibility, with both of accuracy and precision within 20 % at LLOQ and within 15 % even at other concentrations. *1: This curve is drawn on logarithmic scale. *2: QC sets 1 and 2 were analyzed over a 2-day period, with each set of concentrations analyzed five times. Lipid mediators are bioactive lipids produced in trace quantities in biological body. They are deeply involved in allergic reactions and inflammatory responses. In inflammatory processes, multiple lipid mediators are mutually correlated, and the inflammatory induction or regression reaction is facilitated by the induction or termination of their production. In these processes, a high sensitivity analysis is required in order to correctly evaluate lipid mediators, as their concentrations in biological body fluctuate significantly. The analysis data shown below is representative for five standard lipid mediators, including leukotriene and HETE. Micro-flow conditions produce a 10-fold increase in sensitivity compared to semi-micro flow rates in both positive and negative mode. Also presented are results for a) 20-HETE, b) 5,6-DiHETE, and c) LTD4, which were spiked in plasma from a trace quantity (50 fg) standard product, as well as d) intrinsic LTD4 in plasma. The lipid mediators a), b), and c) spiked in plasma were confirmed at micro flow rates.